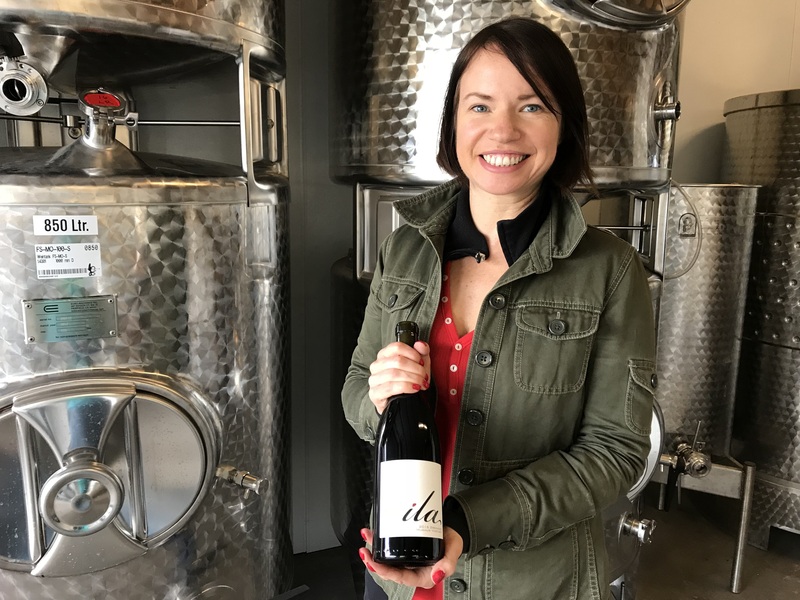 Mary Bradley’s focus as a winemaker is to let the true nature of the grapes shine through, and the wines in her ila and Gra labels are prime examples of her talent. With practiced eyes, Mary Bradley scans the clusters of Zinfandel grapes as they toddle down the sorting table. She plucks those that don’t match the quality she’s looking for—grape size, ripeness, ratio of fruit to stem—and tosses them aside into a waiting bucket. Seemingly random and nonchalant to our untrained eyes, her choice of one cluster over another reveals her talent and innate sense as a winemaker. 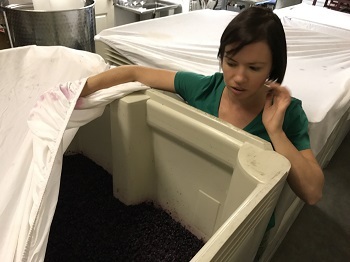 The clusters that do pass Bradley’s exacting standards tumble into the large bin, where her bare feet crush a few layers of grapes to start the fermentation process. In two years, today’s efforts will be bottled as her ila 2017 Zinfandel. 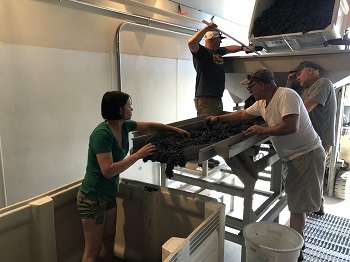 Not only is her newest wine beginning its journey on this warm October day at Cotiere Wine in Santa Maria, but Bradley now begins the second decade of her journey as a winemaker. Rewind to 2004. Bradley has just started working at The Earle. An award-winning restaurant in Ann Arbor, Michigan, The Earle specializes in French and Italian country cuisine. But it’s the restaurant’s wine list—more than 1,200 selections—that has made the wine world sit up and take notice. Bradley sorts the best fruit for what will be her whole-cluster Zinfandel wine for her ila label. During her four years at The Earle, Bradley was officially bitten by the wine bug. She knew this was the career path she wanted to follow. 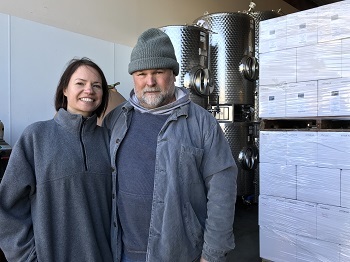 Mary Bradley and mentor Kevin Law, at his Cotiere Wine in Santa Maria. Like any dream envisioned, things started happening to help bring her dream to reality. She started looking at opportunities and applied for a position with Tantara Winery in Santa Maria in 2008. When she got the job, she moved across the country and jumped in. During her first harvest, she helped produce 8,000 cases of Pinot Noir under the direction of winemaker Kevin Law. That first harvest experience sealed the deal. She fell in love with the wine industry and the Central Coast. A connection she made at Tantara led to a position with a large winery in Marlborough, New Zealand, and she headed there for her second harvest in early 2009. After a year in Marlborough, she made her way back to the Central Coast—and a new position as eonologist at Zaca Mesa Winery in Santa Ynez. “The New Zealand experience helped me know better the processes in a large-production winery,” she said. During her first season at Zaca Mesa, they produced 25,000 cases. After two and a half years in the lab, she left to earn her enology degree at Hancock College. During that time, she had the opportunity to work once again with Kevin Law. Kevin Law readies one bin of Tres Niños Zinfandel for today’s crush at his Cotiere Wine in Santa Maria. Law had started his own winery in 2006. Then, after he left Tantara, he founded Cotiere winery in 2011, where he creates wine under his Cotiere and Perfect Left labels, as well as custom production for private clients. 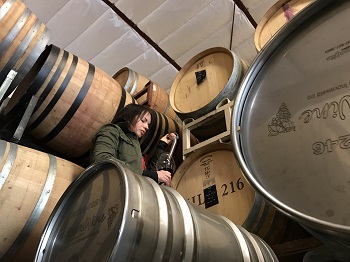 Bradley’s first vintage of her own production was the 2014 Syrah under the ila label, which is a partnership with Bradley and wine store owner Ash Mehta. Ash and Lissa Mehta own Tastes of the Valley in Pismo Beach, Tastes in the Alley in Paso Robles, and the new WineSneak in San Luis Obispo. Bradley is Wine Director at WineSneak, and previously worked at Tastes of the Valleys. 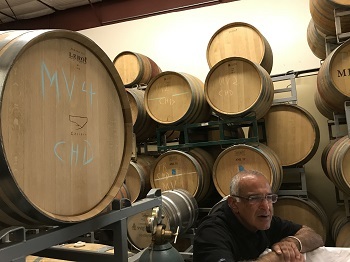 Ash Mehta, surrounded by barrels at Cotiere Wine, partnered with Bradley to create the ila wines. This inaugural wine received 93 points from Wine Enthusiast, and Bradley’s upcoming vintages are equally promising. In addition to the ila label, she’s also building her own label: Gra. Its vintages will include 2015 Zinfandel, 2016 Grenache, and 2016 Zinfandel. Bright fall sunshine warms the cool space at Cotiere Winery in Santa Maria, as Bradley awaits delivery of 2,000 lbs. of Zinfandel grapes. At sunrise this morning, she was working alongside Greg and Terry Lukens, owners of Tres Niños Vineyard outside Arroyo Grande, and Michael DePaola, who owns the neighboring DePaola Vineyard. Together with vineyard manager Rodrigo and his crew, they were picking the best fruit for today’s crush. Located past Lopez Lake, near Saucelito Canyon’s old-vine vineyard, Tres Niños maintains six acres. This year marks the 20-year anniversary of the vineyard’s planting of Zinfandel and Petite Syrah. Bins holding 2,000 lbs. 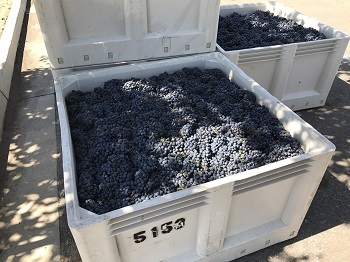 of Zinfandel from Tres Niños Vineyard await sorting and (perhaps) destemming. 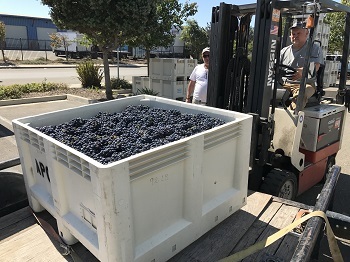 As the flatbed trailer, loaded with bins of deep purple grapes, backs up to the overhead door, Bradley shares how special it is to have the vineyard owners and winemakers here at the same time. In addition to today’s whole cluster Zinfandel, Bradley is overseeing the sorting for additional wines under her direction. Bradley checks the fermentation of Syrah from Zaca Mesa. After all the grapes are processed, she checks her fermentations in the front of the winery. Lifting the canvas covers, she warns us not to breathe too deeply, as a layer of carbon dioxide settles above the grapes. This Syrah from Zaca Mesa will be bottled for her ila label. After she checks the temperature of each bin, she covers them back up and heads back to the production area. 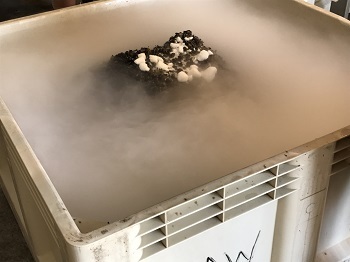 Kevin Law breaks open several bags of dry ice and adds them to the bin of whole-cluster Zinfandel. It starts bubbling and hissing like a high-school science project. Dry ice starts the cold soak for Bradley’s whole-cluster Zinfandel. He maneuvers the forklift to pour the contents of this last bin into a large tank. There, it will cold soak for a few days before starting the fermentation process. As today’s crush winds down, Bradley shares her vision for this vintage. And what about her focus for her second decade as winemaker? Bradley samples one of her Syrah wines to assess its progress. Through every bottle, Bradley’s talent as a winemaker is evident. We’re looking forward to tasting this whole-cluster Zinfandel when it’s ready, and trying Bradley’s other wines under the Ila label and the new Gra label. 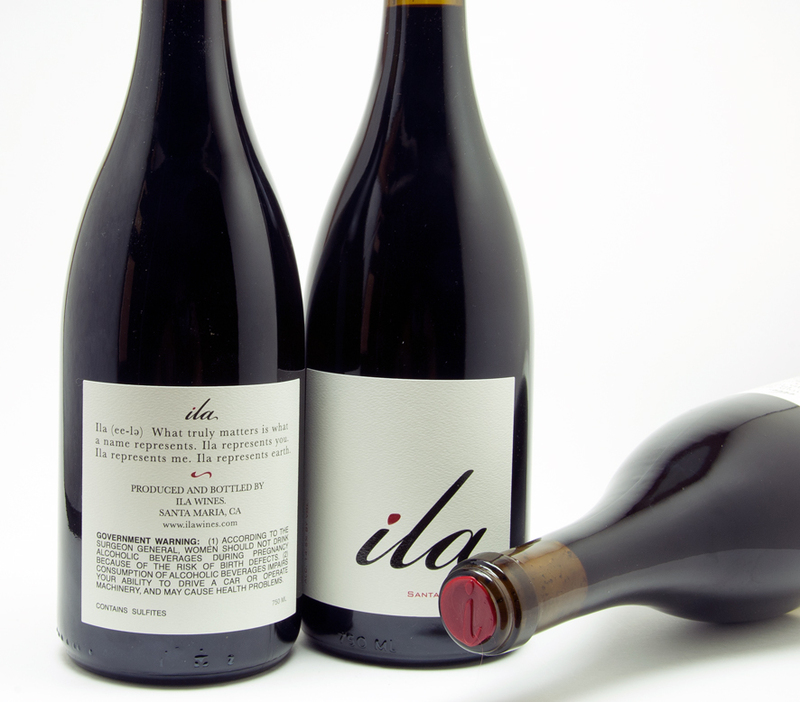 Current vintages include 2014 Ila Syrah/Santa Ynez Valley and 2016 Ila Grenache/Murmur Vineyard. The Flavor Team wants to thank Mary Bradley for generously sharing her time and spirit for this story; Kevin Law of Cotiere Wine; Greg, Terry, and Dexter Lukens of Tres Niños Vineyard; Michael DePaola of DePaola Vineyard; Ash Mehta of Tastes of the Valleys and WineSneak; and the great crews at harvest and crush. Cheers!